And accommodating. Breakfast was included and was delicious. Even had our washing done and ironed. This is my favourite place to stay in Bali, I would live here if I could.. As a single mum tavelling with a toddler I can’t recommend Villa Besar enough. I’ve stayed in ALOT of places here, from 5 star resorts to budget accommodation and everything in between- From Elephant Safari to Benoa & many places between. Villa Besar tops the list, an absolute pleasure to stay here. A lovely peaceful sanctuary which more than makes up for not being v close to beach. Sooooo spacious, great for my son who was over being couped up in hotel rooms, immaculately clean, delicious food & drinks right at your doorstep/room service, so convenient having your laundry and house keeping taken care of daily. Private pool, bath and super comfy huge bed. We ate at the restaurant but also Bali Buda is just down the road so we got takeout/delivery from there just to change it up. There were other families in the villas nearby who we met at breakfast in restaurant and everyone was v happy and friendly. The staff are also amazing. I stayed here with my 1.5 yr old son and they couldn’t help me enough, even looking after him while I ate my breakfast in peace one day when I really needed a break & then organising a massage in my villa complete with free babysitting. I felt so safe, supported and looked after. Honestly I can’t fault Villa Besar or anyone/anything about it. It’s away from the hub so you need transport but the driver there will take you anywhere (nothing is too much trouble) I already have and will continue to share this gem with everyone I know. Thank you so so much to the lovely owner Jenny & all at Villa Besar, you made Tobias’ and my Bali adventure absolutely wonderful & I am deeply grateful. For making our Wedding one of the most special day of our lives. as we wouldn’t keep it and we have all our beautiful photo’s. The 5 star reviews are all true, very clean, very well cared for and maintained, amazing staff who are willing to help out in any way they can – from delicious food, even for those with allergies, laundry is done daily, room service, amazingly friendly staff and did I mention the beautiful private villas, we had Villa 4 for a couple, Villa 4 for a very big family group and pre-wedding party, Villa 10 for 4 and family Villa 12 for two families . All with clean pools and beautiful furnishings, wifi, very comfortable beds, air con and fans, warm lovely showers, kitchens are well equipped. 10/10. Would love to return one day. I just come back from Bali and stayed in the One-bedroom at Villa Besar last week (13 Oct-18 Oct) and found that the Staff and Premises exceeded my expectations. Great service from Airport pick up to drop off and everything in between with the breakfasts, cooked lunches when we had our feasts, security and more. Special mention to Nanik, Dira, Annie and Mira who catered to my requests and desires, nothing was a problem. Having security there made it a safe place to stay for me as a single women on my own away from the group who were in the other Villas. Thank you Villa Besar, I’m coming back!!!! I was staying with my family in Villa 1 from 11/10/13 – 21/10/13 and wanted to let you know how impressed I was with your villas. In addition, I wanted to extend my thanks once again to the lady that cooked and cleaned our villa every day – Marte (Julie) – not sure how to spell her name correctly. She was always smiling, attentive, courteous and willing to help in any way that she could from cooking our breakfast to cleaning our room, watching my boys or organising a hair dresser for the day of the wedding. She said good morning every day and goodbye when she finished her shift. My boys (2 and 4) warmed to her very quickly. As a business owner myself, I know that it’s important that the staff you keep needs to be dedicated to their job as they are the face of your business. You can rest easy knowing that she is doing just that. The security guards that sat outside our villa every night and the various staff members around the place were also very polite and courteous and always ready to help – opening the villa doors when we returned with sleeping children or assisting with the many late orders from the villas that we all occupied for Burger King or McDonalds. 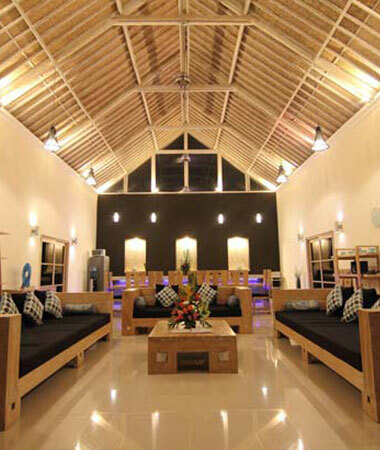 I have no hesitation in recommending your villas to friends and family should they wish to travel to Bali in the future – or if I have the opportunity to come again. The size and layout of the villa was perfect for a large group like ours. We had plenty of space to come together & socialise, as well as having the kid’s room and very large bedrooms that we could retreat to if we wanted some downtime. I was delighted with the location of the villa- off the road – so that once inside the walls of the villa it was completely quiet & serene. Having the little shop & the cafes just at the end of the lane way made it very convenient for picking up extra drinks & snacks as well as ordering lunch & coffee from the Bumbak Cafe. Putu, the owner, was very gracious & happily brought our orders down to the villa for us which was just fantastic. The drivers were fantastic & very helpful & patient, and the security guards were just great at night when we needed a hand ordering food to be delivered, etc. The girls who came to the villa to do the massages. pedicures etc were really, really good & the prices were fantastic. I think we had them booked almost every day of our stay. The meals that the staff prepared for us were always delicious, nothing was too much trouble, and there always heaps of food for everyone. The daily laundry & cleaning by the staff was great and very efficient. The team were always around to help out, but never intrusive and seemed to almost magically get all the work done without us even realising it. We have all agreed that we’ll be back both as a group and separately, so thank you so much for providing such a wonderful place and a great team to create perfect holidays. I would just like to say thank you for providing the perfect environment for a relaxing, and fun, family holiday. Both the villa and the pool were of a standard above what we were expecting. We spent hours in the pool, and having the pool fence meant we weren’t worrying about the kids getting in without adult supervision. The resident geckos and fish provided a lot of entertainment. Having a cooked breakfast was a great start to the day, and beautifully washed clothes was a treat – thanks Madi. Nanick was very helpful and went out of her way to be of assistance, along with the other office staff. We were a little worried about being out of the main areas, but were pleasantly surprised to find that arranging transport was very easy and inexpensive. We used the villa’s van for family excursions, and it was nice knowing the drivers, and the vans were very comfortable. Two of our guests had not been to Bali before, and because of the affordable luxury, as well as the feeling of security, provided by you and your staff, they have gone home with lovely memories of a wonderful holiday. This was my second time staying at Villa Besar. The first time I stayed with my girlfriend in villa #7 a one bedroom villa for 5 days back in February / March. This time we stayed in villa 4 which is the largest of the 12 or 13 villas which has 6 huge rooms and a massive yard and two side by side pools (kids / full size) with 12 family members. Our family can’t stop raving about the venue. The staff are fantastic, they speak great English and nothing is too much trouble. They constantly have a smile on their faces, greet you each time they see you and just make you feel welcome and comfortable. We felt safe and secure staying in this part of seminyak. It may be a little further out then other places but that doesn’t mean you miss out. 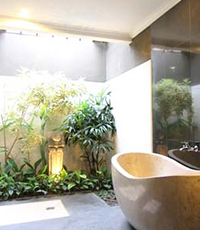 There are some great warungs and spas near by and getting into the main part of seminyak is just a short trip away. We all loved the room service provided by the restaurant at the front of the villa: Happy Buddha. Our favourite meal was the Happy Buddha beef burger. Yum yum yum!! My husband and sister in-law’s partner are burger snobs and they definitely rate their burgers as one of the best they’ve had in Bali and back in oz. It was simple but tasty as. We also got married in the villa we stayed in. Once this villa is set up it is just transformed and looks amazing. All in all we highly recommend these villas. In order to book you communicate with the Aussie owners and pay in aud to an AU bank account. Nice and simple. We highly recommend Villa Besar.